Compile options: Please keep the default value if you are unsure about these options. Toolbar buttons: The buttons on CHM toolbar. See 2 in the Screenshot and quick reference for Classic CHM – Default template. See 2 in the Screenshot and quick reference for Classic CHM – Simple template. 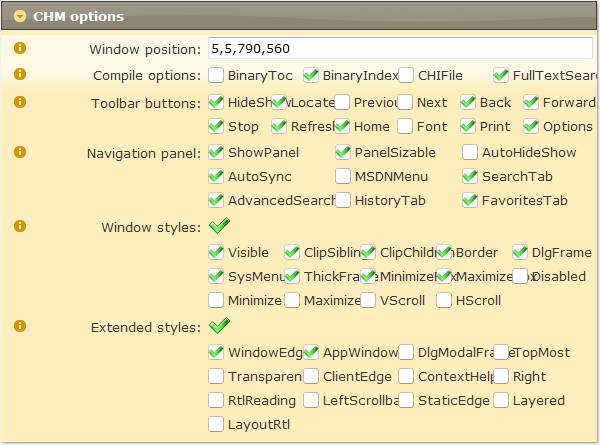 Navigation panel: The panels of CHM and panel options. See 3 in the Screenshot and quick reference for Classic CHM – Default template. See 3 in the Screenshot and quick reference for Classic CHM – Simple template. BORDER: Creates a window that has a thin-line border. CAPTION: Creates a window that has a title bar (includes the BORDER style). CHILD: Creates a child window. This style cannot be used with the POPUP style. CHILDWINDOW: Same as the CHILD style. CLIPCHILDREN: Excludes the area occupied by child windows when drawing occurs within the parent window. This style is used when creating the parent window. CLIPSIBLINGS: Clips child windows relative to each other; that is, when a particular child window receives a WM_PAINT message, the CLIPSIBLINGS style clips all other overlapping child windows out of the region of the child window to be updated. If CLIPSIBLINGS is not specified and child windows overlap, it is possible, when drawing within the client area of a child window, to draw within the client area of a neighboring child window. DISABLED: Creates a window that is initially disabled. A disabled window cannot receive input from the user. DLGFRAME: Creates a window that has a border of a style typically used with dialog boxes. A window with this style cannot have a title bar. GROUP: Specifies the first control of a group of controls. The group consists of this first control and all controls defined after it, up to the next control with the GROUP style. The first control in each group usually has the TABSTOP style so that the user can move from group to group. The user can subsequently change the keyboard focus from one control in the group to the next control in the group by using the direction keys. HSCROLL: Creates a window that has a horizontal scroll bar. ICONIC: Creates a window that is initially minimized. Same as the MINIMIZE style. MAXIMIZE: Creates a window that is initially maximized. MAXIMIZEBOX: Creates a window that has a Maximize button. Cannot be combined with the CONTEXTHELP style. The SYSMENU style must also be specified. MINIMIZE: Creates a window that is initially minimized. Same as the ICONIC style. MINIMIZEBOX: Creates a window that has a Minimize button. Cannot be combined with the CONTEXTHELP style. The SYSMENU style must also be specified. OVERLAPPED: Creates an overlapped window. An overlapped window has a title bar and a border. Same as the TILED style. OVERLAPPEDWINDOW: Creates an overlapped window with the OVERLAPPED, CAPTION, SYSMENU, THICKFRAME, MINIMIZEBOX, and MAXIMIZEBOX styles. Same as the TILEDWINDOW style. POPUP: Creates a pop-up window. This style cannot be used with the CHILD style. POPUPWINDOW: Creates a pop-up window with BORDER, POPUP, and SYSMENU styles. The CAPTION and POPUPWINDOW styles must be combined to make the window menu visible. SIZEBOX: Creates a window that has a sizing border. Same as the THICKFRAME style. SYSMENU: Creates a window that has a window-menu in its title bar. The CAPTION style must also be specified. TABSTOP: Specifies a control that can receive the keyboard focus when the user presses the TAB key. Pressing the TAB key changes the keyboard focus to the next control with the TABSTOP style. THICKFRAME: Creates a window that has a sizing border. Same as the SIZEBOX style. TILED: Creates an overlapped window. An overlapped window has a title bar and a border. Same as the OVERLAPPED style. TILEDWINDOW: Creates an overlapped window with the OVERLAPPED, CAPTION, SYSMENU, THICKFRAME, MINIMIZEBOX, and MAXIMIZEBOX styles. Same as the OVERLAPPEDWINDOW style. VISIBLE: Creates a window that is initially visible. VSCROLL: Creates a window that has a vertical scroll bar. ACCEPTFILES: Specifies that a window created with this style accepts drag-drop files. APPWINDOW: Forces a top-level window onto the taskbar when the window is minimized. CLIENTEDGE: Specifies that a window has a border with a sunken edge. CONTEXTHELP: Includes a question mark in the title bar of the window. When the user clicks the question mark, the cursor changes to a question mark with a pointer. If the user then clicks a child window, the child receives a WM_HELP message. The child window should pass the message to the parent window procedure, which should call the WinHelp function using the HELP_WM_HELP command. The Help application displays a pop-up window that typically contains help for the child window. CONTEXTHELP cannot be used with the MAXIMIZEBOX or MINIMIZEBOX styles. CONTROLPARENT: Allows the user to navigate among the child windows of the window by using the TAB key. DLGMODALFRAME: Creates a window with a double border; the window can optionally be created with a title bar by specifying the CAPTION style in the dwStyle parameter. LEFT: Window has generic "left-aligned" properties. This is the default. LEFTSCROLLBAR: If the shell language is Hebrew, Arabic, or another language that supports reading order alignment, the vertical scroll bar (if present) is to the left of the client area. For other languages, the style is ignored and not treated as an error. LTRREADING: The window text is displayed using Left to Right reading-order properties. This is the default. MDICHILD: Creates an MDI child window. NOPARENTNOTIFY: Specifies that a child window created with this style does not send the WM_PARENTNOTIFY message to its parent window when it is created or destroyed. OVERLAPPEDWINDOW: Combines the CLIENTEDGE and WINDOWEDGE styles. PALETTEWINDOW: Combines the WINDOWEDGE, TOOLWINDOW, and TOPMOST styles. RIGHT: Window has generic "right-aligned" properties. This depends on the window class. This style has an effect only if the shell language is Hebrew, Arabic, or another language that supports reading order alignment; otherwise, the style is ignored and not treated as an error. RIGHTSCROLLBAR: Vertical scroll bar (if present) is to the right of the client area. This is the default. RTLREADING: If the shell language is Hebrew, Arabic, or another language that supports reading order alignment, the window text is displayed using Right to Left reading-order properties. For other languages, the style is ignored and not treated as an error. STATICEDGE: Creates a window with a three-dimensional border style intended to be used for items that do not accept user input. TOOLWINDOW: Creates a tool window; that is, a window intended to be used as a floating toolbar. A tool window has a title bar that is shorter than a normal title bar, and the window title is drawn using a smaller font. A tool window does not appear in the taskbar or in the dialog that appears when the user presses ALT+TAB. TOPMOST: Specifies that a window created with this style should be placed above all non-topmost windows and should stay above them, even when the window is deactivated. To add or remove this style, use the SetWindowPos function. TRANSPARENT: Specifies that a window created with this style is to be transparent. That is, any windows that are beneath the window are not obscured by the window. A window created with this style receives WM_PAINT messages only after all sibling windows beneath it have been updated. WINDOWEDGE: Specifies that a window has a border with a raised edge.